OVERVIEW The historic D Bar Ranch is a magnificent 7,656 +/- acre property in northern Coke County, Texas that has been owned by the same family since the 1950’s. The ranch is located within a unique, transitional area that combines aspects of the central Texas hill country, south Texas brush country, and vistas more typical of the west Texas high plains. The Property consists of rugged hills and mesas, thick draws and open meadows, as well as plentiful water features such as ponds, seasonal creeks and windmills. Numerous hilltop vantage points provide stunning views in all directions. The fertile soils support healthy native grasses like little bluestem, hooded windmillgrass, buffalo grass, sideoats grama, hairy grama, green sprangletop, white tridens, canada wildrye, and many others. Woody plants consist of ashe juniper, shin oak, massive live oaks, cedar elms, groves of post oaks, other big hardwoods, old-growth mesquite, and a diverse selection of other native brush and plants more common to the arid regions of South and West Texas. LOCATION D Bar Ranch is located between Abilene and San Angelo, Texas. The closest town to the main headquarters, Blackwell, Texas; is located a few miles east of the ranch’s north gate. Blackwell is a quiet town with grocery store, feed store, hardware store, gas stations, post office, restaurants, and other convenient infrastructure. Oak Creek Lake is adjacent to Blackwell and provides great recreational activities. Midland is a 2-hour drive, Abilene and San Angelo are both approximately one hour. The south gate is located closest to the Coke County Seat of Robert Lee; which also has a convenient infrastructure with many amenities. IMPROVEMENTS D Bar Ranch headquarters consists of two modest houses (3 bedrooms each) located in the east-central area of the property. Adjacent to the houses are two beautiful ponds encompassing approximately 5 acres stocked with bass and sunfish. Enormous pecan and live oak trees are found throughout the HQ area. A manicured 25+ acre food plot is visible from the main house, providing excellent wildlife viewing from the porch. A large pole barn, cattle working pens, horse stalls, chicken coop, carport, and critical ranch infrastructure are all in place. The headquarters is served by a reliable water well that serves both houses and all HQ facilities. A pila deck was creatively constructed to convert the old concrete water reservoir into an attractive, chlorinated swimming pool shaded by live oak trees. Plentiful livestock and wildlife water is provided throughout the ranch by 9 windmills, 1 solar water well, and 2 electric water wells, and concrete pila storage tanks with drinking troughs. There are steep drainages and excavated dirt tanks throughout the ranch that hold water. The ranch perimeter is low-fenced, with the exception that a small percentage of high fence boundary on the west side. Approximately 80% of the ranch’s fencing has been replaced in the last 8 years. Cattle can be rotationally grazed in 7 separate interior pastures. There is an old asphalt runway over a mile in length that is high fenced and could be resurfaced and restored to functionality. ACCESS The most convenient access is via a well-maintained county road that runs west from Blackwell to the gate on the northeast corner of the ranch. Inside the gate, an impressive main caliche road with 4 major concrete spillways provides all- weather access the length of the ranch ending at the south gate. Additional major and minor ranch roads provide vehicle and ATV access to all areas of the ranch. From the south gate, Graham Valley Road provides access to HWY 158 and the nearby towns of Robert Lee and Bronte. WILDLIFE D Bar is teeming with wildlife – native whitetail deer are abundant and free to roam. The bucks grow impressive racks when they reach maturity. Average body and antler sizes in this region are slightly larger than typical “Hill Country” whitetails can achieve. Healthy populations of Rio Grande turkeys roost throughout the ranch. Bobwhite quail are plentiful, and quail hunting can be excellent in good rain years. Both mourning and whitewing doves migrate through the area by the thousands, along with waterfowl and sandhill cranes. Gadwall, wigeon, blue and green-wing teal, pintails, and the occasional mallard can all be found on the HQ ponds in Fall and Winter. 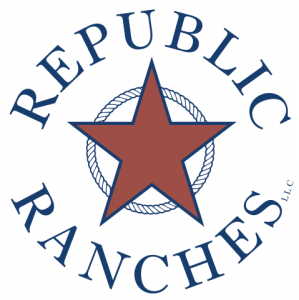 CONTACT: Wallace Nichols PHONE: (713)253-6021 EMAIL: nichols@republicranches.com The information contained herein has been gathered from sources deemed reliable; however, Republic Ranches, LLC and its principals, members, officers, associates, agents and employees cannot guarantee the accuracy of such information. The information contained herein is subject to changes, errors, omissions, prior sale, withdrawal of property from the market without prior notice, and approval of purchase by owner. Prospective buyers should verify all information to their satisfaction. No representation is made as to the possible value of this investment or type of use, and prospective buyers are urged to consult with their tax and legal advisors before making a final determination. Real Estate buyers are hereby notified that real properties and its rights and amenities in the States of Texas; Oklahoma; and New Mexico are subject to many forces and impacts whether natural, those caused by man, or otherwise; including, but not limited to, drought or other weather related events, disease (e.g. Oak Wilt or Anthrax), invasive species, illegal trespassing, previous owner actions, neighbor actions and government actions. Prospective buyers of Texas real estate, New Mexico real estate or Oklahoma real estate should investigate any concerns regarding a specific real property to their satisfaction. When buying investment property the buyers agent, if applicable, must be identified on first contact and must be present at initial showing of the property listing to the prospective real estate investor in order to participate in real estate commission. If this condition is not met, fee participation will be at sole discretion of Republic Ranches, LLC.